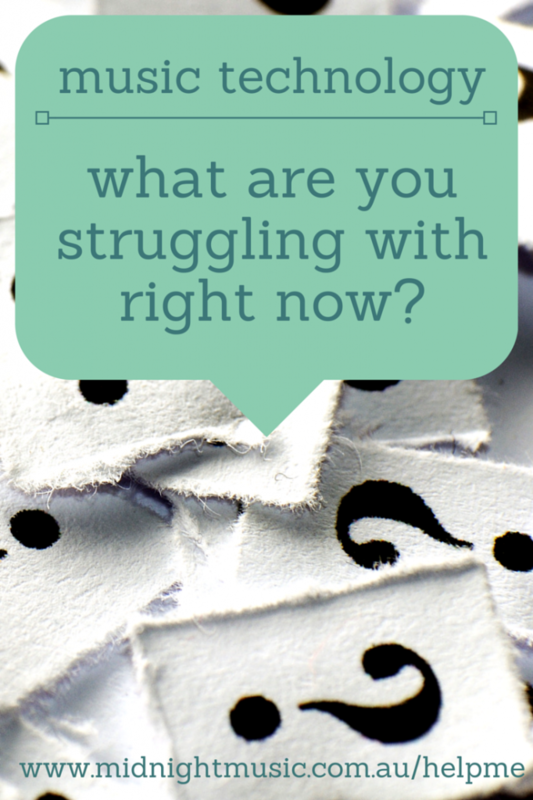 What are you struggling with right now? “Silly” and “dumb” questions invited! Do you have a music technology question or struggle? The start of a new year is always motivational for me – it’s a time to reflect on the previous year, set goals and look ahead to the exciting thing to come. Here in Australia, this time of year is all about the beach, staying cool on extreme summer days, BBQs and gearing up for the start of our school year. I know those of you outside Australia find it strange that we start our school year at the end of January, but to us it makes perfect sense! Lately I’ve been working on my calendar of workshops and conference presentations and planning new music tech courses (more on that later!). 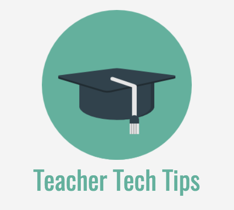 I’m also planning content for my blog – more useful music tech-related articles, tutorials, lesson plans and tips – and this is where YOU come in. What sort of music technology help or advice would you like? how do I add an audio file to a Powerpoint presentation? how do I video my students and share the videos? 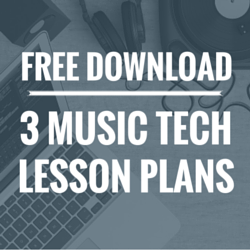 how do I assess music technology projects? how do I choose apps for my iPad? 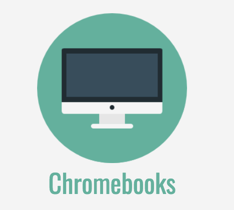 how can I utilise just one computer in the classroom? I’d love to hear from you. Leave your question as a comment at the bottom of this post. The most popular ones will be answered in a future blog post (maybe even in a video format!). I had the brilliant idea of mashing two songs together with the same chord progressions but have no idea how to speed up/ slow down tracks using either mac or android/ pc. Any ideas? Somehow I got 2 YouTube accounts — both are for my music studio (piano). The original one has most of my videos on it but suddenly the Ipad I use to record started sending them to the other account (the second was set up by accident). I would like to have everything on one account. Is there a way to fix this? iPad mirroring with Apple TV. I am connected to the district network, but, the network has “hiccups” and I get disconnected too frequently. I have read that there is a way to mirror the iPad in a way that the Apple TV itself “is” a network, and the iPad mirrors to the Apple TV without any hiccups. Ever run into this problem? It’s always annoying when you are teaching, and the students have to wait for the iPad to “wake-up” again. You are amazing Katie- thanks!! I created an 8 minute lesson on the Educreations app on my iPad. Is there only one finished project I can have? The tech gal in my building couldn’t figure out why it only holds 1 project. I made a second project but it will not let me save it. Help! Is this an app that you have to pay for to get more storage space? Hi Katrina. This is an embarassing question. Although I use music technology, I have never really understood how MIDI works. I understand it in theoretical terms, but not in practical terms. Can you help? Hi Katy, I’d love to have a special course/program aimed at introducing the peripatetic solo instrument teacher to the amazing apps and technology available nowadays. Honestly, too many of us are behind the times. So much of what is discussed is directed toward classroom instruction, and I find my colleagues who teach one-on-one are not aware of how so many things on offer can change the way they teach. At least a Pinterest board with some ideas for us would be great. 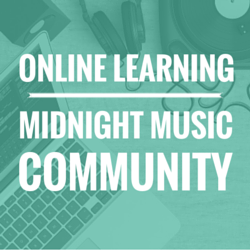 Hi Katie – I’ve done basic garage band with the kids at school. Had to create an 8 bar song but with a beat, rhythm, guitar chords and then overlaying melody. Just interested to know what you would do as the next step up from that? Where to? Thanks, Kristin. You could add another 8 bar section (ie Chorus) then have the kids extend their song forms? If some are more adventurous (not sure what Year level you are working with here) they could extend their song with an Intro or a Bridge, then repeat the first 8 Bar section. I would like to know of a reasonably priced app that can extract MIDI files into separate tracks including a click track. I would like to be able to use these as rehearsal sound files for my acapella group. I teach band, choir, and some general music. Some of my band friends are using technology in the ensemble and I don’t understand it. For instance, a friend posted a picture the other day where everyone had ipads on the music stands. The ipads all said different notes, so I’m guessing they were tuning. How could the ipads tell who was who?! Also, sometimes people project a tuner from their ipad and then tune students… if the ipad is up front, how can it hear each student? Or even weirder, sometimes they all play at once with the projected tuner. What is it listening to?! Thanks for this opportunity, Katie! my ‘silly question’ really IS, “How do I add an audio file to a Powerpoint slide show?” even when a carefully constructed sound track appears to work on my own computer, wben I make a DVD for use by someone else there seems to be no connection between the visual and the audio elements, with the audio often missing. 1. Where to get short silent movies to down load so kids can create sound tracks for them in Garage Band? Is there a source? Or should we just make them? 2. Is there such a thing as I Pad Band Music (sheet music) written specifically for students anywhere? Or should we keep breaking down simple 3 or 4 chord songs? Just wondering what i-pad you would recommend buying which best suites music teachers. How do i use iPads with my prep class? I have to suggest some apps to go on their iPads. I have two questions, and thank you for the opportunity. First I would like your opinion regarding recording students for voice assessment, as to what program to use, and the best way to store and share this data. I would like to hear your suggestions for creating student portfolios. I would like students to be able to have access and share progress with parents online. Thanks again for all you do. 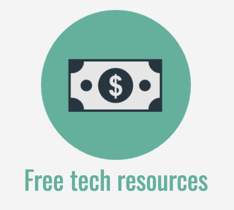 I find your resources to be extremely valuable, and useful! I’m so glad you asked! I’m involved in a project right now writing theory exams for our local piano festival. (7 levels of pre-college theory) I’m using MuseScore which is a pretty powerful, free notation program, but it’s quite difficult to format pages the way I need to – with text instructions, a need to space some system lines much farther apart than others, sometimes needing to use a single staff on a system and sometimes a grand staff, etc. I end up sometimes writing one line at a time, printing it, then physically cutting and pasting it on a page, photocopying, and using white-out to clean up the page. I could write the tests by hand in 1/4 the time, but we want it to look professional. Do you have any suggestions for a low-cost solution? My district is offering a grant opportunity for teachers and I want to apply. However, I am having difficulty thinking of a project to ask to be funded. At first I thought I’d ask for a Smartboard, but beyond my regular music instruction, I cannot think of a specific project to create using a smart board. I have an IWB- Mimio and the more I thought about it, the more it seemed a smart board wasn’t necessary. 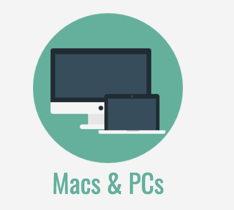 I have 10 iPads, an apple TV, an IWB and a MacBook Pro- As far as technology is concerned, I’m pretty well off. The district is providing us with a great opportunity and now I am struggling to find a project. My most recent thought is to Skype with another music class from another part of the country/world. We could sing/play for one another. Beyond as webcam, which I have on my MacBook, I don’t know what I would need. What are your thoughts? Is there some other project I could use to write the grant? I need to provide a timeline if I am awarded and the end result would be the final project or goal. Thank you! Need to quickly and simply record pupil performances or oral evaluations without taking up too much of my valuable and scarce preparation time? What am I struggling with right now? Sibelius 7 worksheet creator. I want to change some of the template worksheets to suit my needs but they seem to be locked and I can’t figure out how to unlock them or make any changes. Also how to make a worksheet from scratch. 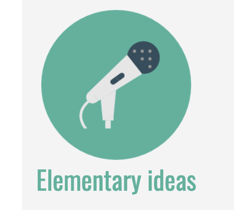 How do I add an audio file to a power point presentation? I don’t use an ipad any more & the tech guy at school says that many of his schools are looking at the surface pro to replace ipads & notebooks. 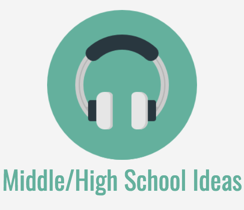 As some of the equipment in my classroom ages – stereo with CD and cassette player!- what is the best way to replace old sound system and join the 21 century? I have a computer and overhead projector in the classroom as well. I have just been given 6 ipads mainly for accessing Google Classroom. (Yr 7 – 13 school NZ). I am overwhelmed with the possibilities. Where do I start? What are ways of proceeding that expand/contribute to what I already do in the classroom for Juniors? Common skills like beat/rhythm/tempo etc and apps for JP students. I am SO INTERESTED in SO MANY of these topics! Thanks for the offer of suggestions and help! How can I extract an audio file from a powerpoint presentation? 1). I have Wendy Stevens’ Rhythm Cups tracks on the computer- how to get into my iTunes and onto my pad and pod? 2). How to take something off Facebook and pin it in Pintrest? How do I import a powerpoint show from my computer to my ipad? Hi Katie! 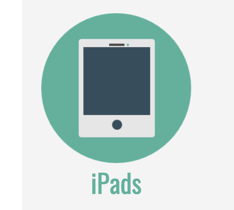 I’d love to know the best way for a student to share a video created in imovie on their ipad. They are usually too big to email. I dont have any space left in dropbox. Thanks heaps!! How do I add an audio file to PowerPoint/Keynote? How do I choose quality apps for my iPad? 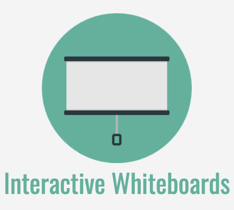 Looking for some simple & PRACTICAL interactive whiteboard activities which a small group of students can complete by themselves while I am working with another small group. Something which develops their understanding of musical theory (for the middle school) or music concepts (tempo, pitch, dynamics etc ) for the junior grades. Love your contribution to music ed. I’m looking for a music reader app for Surface pro 3. Any ideas? I still use Avid scorch on my ipad. It has great potential. How can we put suggestions/pressure on Avid to update it? I’d like to be able to chop bits from Youtube clips to use as specific examples of musical elements in a range of styles. There are so many great resources on Youtube but I need to access them readily in class. Could you please help me with this? I bought an iPad 4 so I could use the many music apps on my smart board at school. Have the app on my windows laptop that is supposed to connect with AirPlay. Wifi is not strong enough in my room. So then I bought an Apple TV 3rd gen. Rev a, so I could use the peer to peer capabilities. Apple TV is not Seeing the iPad. Needless to say, I am pretty frustrated. These were all bought with my money, and I haven’t been able to do anything in my classroom yet. I am really needing some suggestions on what to do next. What should I do with videos of students? I record videos all the time in my classroom. Most of them are full classes playing or singing a song. Some are individual students or pairs playing a song. I record them for assessment, posterity, and as evidence that I am achieving my teaching goals. I have not been asked to do this, I just do it on my own. I have posted a few on my school facebook page (my district is an “opt-out” district and none of my students have submitted an opt out form for publicity). Should I just save them on my network drive and delete them off the iPad? After a few years, I will have a lot of videos to sift through. Or, should I post them all to YouTube? Or, should I email the solo and duet videos to the parents? Or, should I delete all the videos after the school year is over, reserving 2 or 3 for my own evidence/teaching portfolio? I HAVE SO MANY VIDEOS!!! I would love it if my students could record themselves playing recorder from home. Is there a simple way to have students get me recordings? A program so they can record on my website or blog? Does software already exist? Do I just need to have them emailed to me? does anyone know how to change the key of a song in garage band on a mac NOT an ipad? Ha! Nicely played Martin 🙂 Ok – the pressure is on! For years I used Karaoke Party as a Friday activity with my HS choir students. I loved it because it gave them a visual to match pitch and a score when they were done. That site closed down and I’m desperate for a replacement. Do you know of any? Hi Dana! I hadn’t heard of Karaoke Party before but I just looked it up on Youtube so I could see how it works. I don’t know of an exact replacement, but I’m sure there must be something out there! Maybe an iPad app? I’m going to post the question on my Facebook page and see if anyone has a suggestion. I’m wondering if they were shut down due to copyright issues. It does remind me a bit of the way Hook Theory displays their songs but they don’t have the complete song and it’s not set up for singing and feedback – it’s a songwriting resource. Actually – now I think about it, the Smule Karaoke app does that, but the only drawbacks might be that you have to log in to use it and there are in-app purchases.